Have you ever been to a restaurant so well designed that you immediately fall in love with it? The kind of place you want to explore in depth. That is exactly what we found at Mud Street Annex in Eureka Springs, Arkansas. This newly opened offshoot of the original Mud Street Cafe has tons of charm and style. We want to thank Mud Street Annex for their hospitality. Rest assured that all opinions are our own. Our plan had us scheduled to visit the original restaurant, which is housed in the lower level of an building from 1888. The name comes from the history of the area flooding due to a spring that runs under the building. Since those earlier days, the street has been built up to prevent the issues from the past. These days, the area is filled with shops, restaurants, and other flourishing businesses. The original Mud Street is a local landmark, and home of one of the most popular breakfast spots in the region. While our plan was to eat at this iconic site, owner Bobbie Foster suggested we check out the newer location instead. 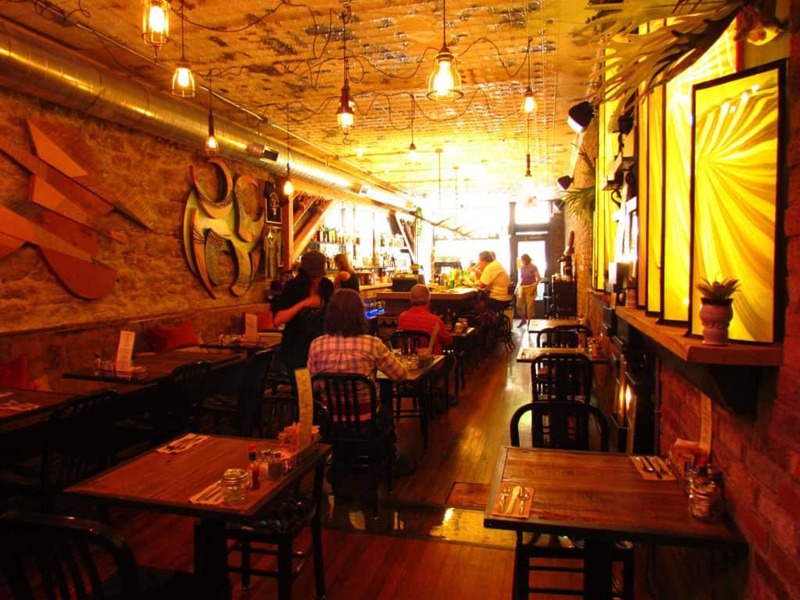 While the original restaurant is basically underground, the newer Mud Street Annex is at street level, and just a couple doors down from the original. We followed Bobbie down the boardwalk, and found ourselves stepping in to her newest project. While the original site is filled with all things old and historic, this new location is a perfect blend of old, new, and artistic. 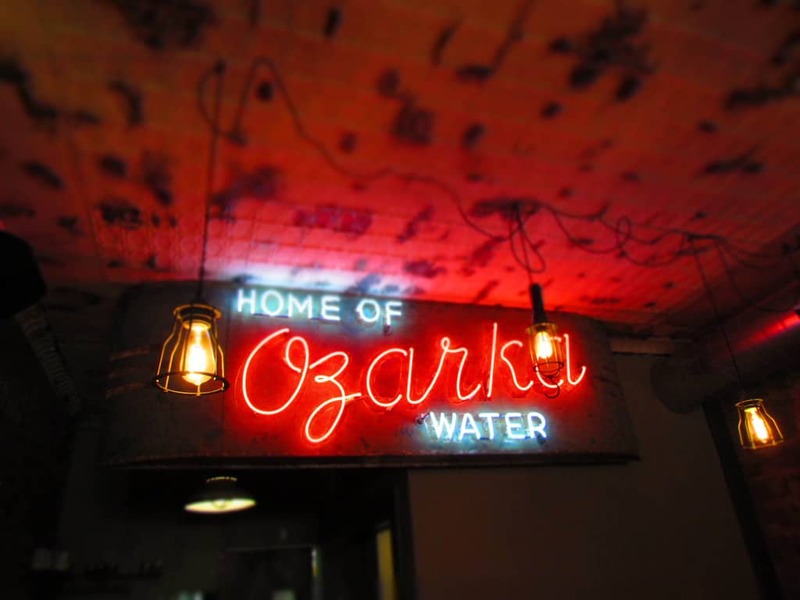 As we entered, our attention was drawn to the large neon “Ozarka” sign on the back wall. 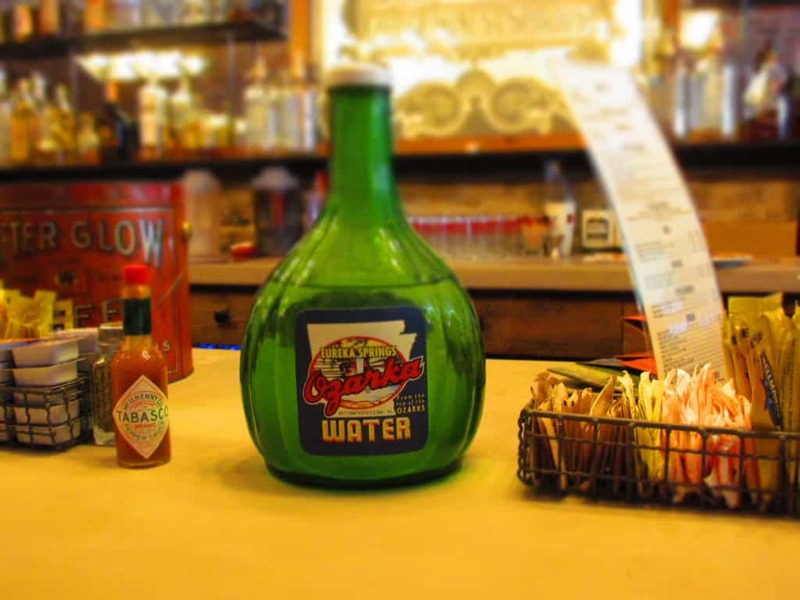 This is an original piece from the bottling company that was originally based in Eureka Springs. Crystal and Bobbie pose in front of a one-of-a-kind stained glass water feature. As she showed us around, it was clear that Bobbie was also in love with her new digs. The collection of artwork is spectacular. On one wall is an amazing stained glass water feature. Across from it are a series of modern pieces that compliment the industrial feel of the space. 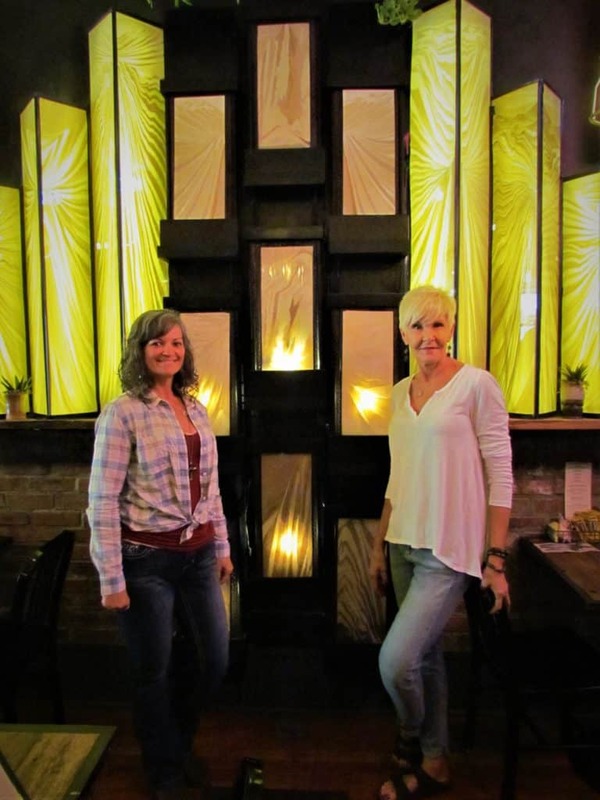 From the lighting fixtures to the exposed limestone and brick walls, and all the way down to the reclaimed wooden bar, it all flows together so well. It is obvious Bobbie had a vision for this space, and it certainly came through in the renovation. Dining with the most unique view we have experienced. Remember that natural spring that runs below the building? Bobbie wanted to pay homage to the origin of the area’s popularity, which sits 20 feet below the floor of Mud Street Annex. To do this, a Plexiglas panel was inserted into the floor. 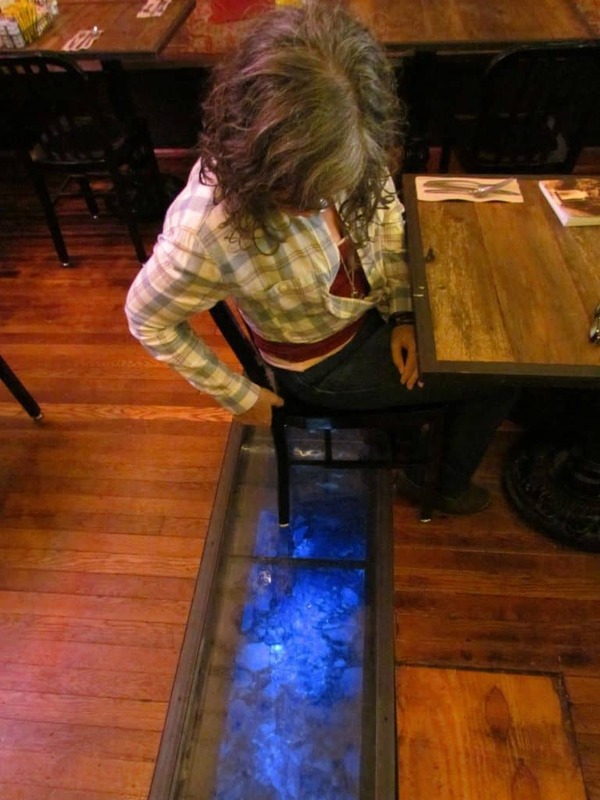 Blue lights illuminate the stream, and allows visitors to see what is going on below. Not only can you look down at it, but one table even has a bird’s eye view of the stream. During our visit, Crystal was given the honor of sitting there. I think she liked it. Now that we had seen most of the unique features of the Main Street Annex, it was time to have lunch. During our tour, the servers would eagerly add informational notes about the place. It was quite clear that everyone was excited to see this restaurant open. Crystal was in the mood for a salad, and the menu had a few to choose from. She skipped the standards to go out on a limb with the Hummus Salad. A bed of greens is accompanied by the expected toppings; like cucumber, tomatoes, shredded carrot, and red onion. This is topped with a generous scoop of garbanzo bean based hummus, which is blended with just a slight kick. 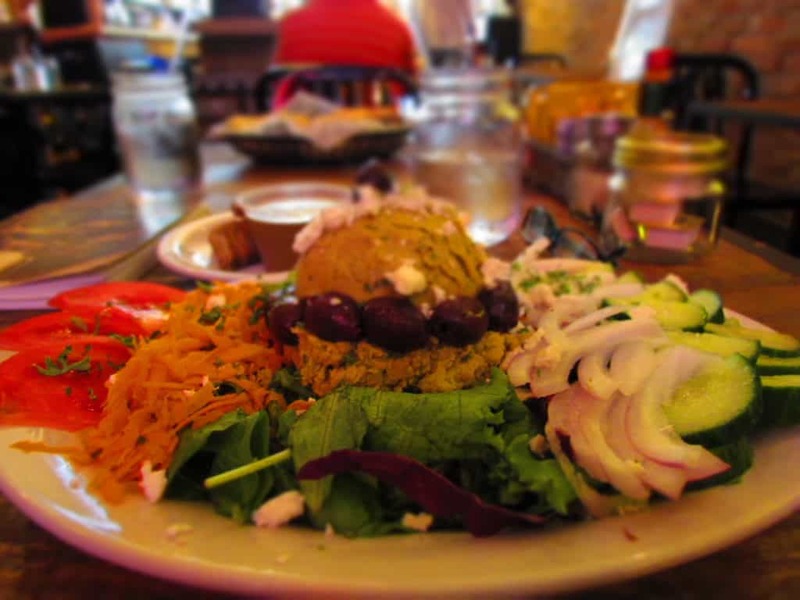 A ring of olives adorn the hummus, and the whole plate is sprinkled with feta cheese. It was a great lunch option that offered a good shot of protein, and Crystal was a huge fan of the dish. 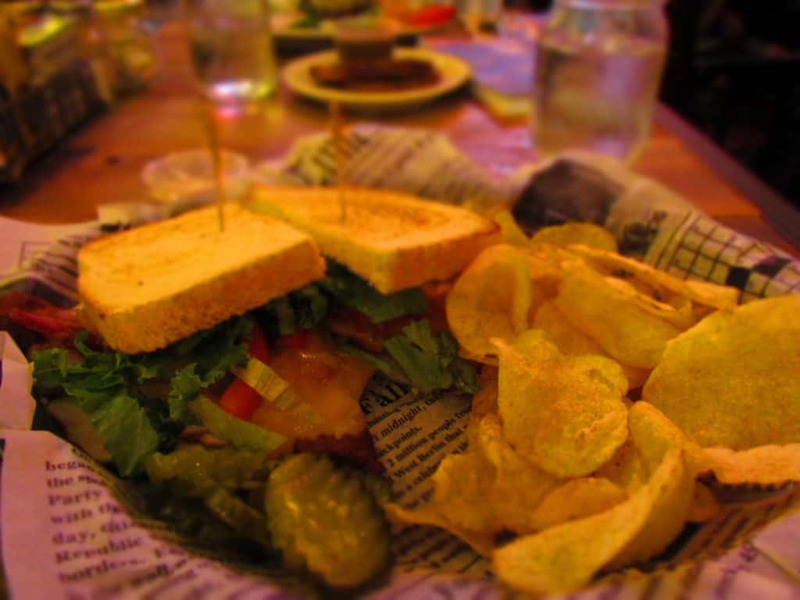 As I looked over the menu, I was immediately drawn to the BLT sandwich. It was the end of a hot summer, and home grown tomatoes were making their last run for the season. Fortunately, I took a second gander at the menu, and noticed a Turkey Bistro offered the flavors of a BLT, but with the addition of turkey breast and cheddar cheese. I immediately switched to this sandwich, which is accompanied by chips and pickle chips. From the first bite, it was obvious that the tomatoes were locally grown. All of the flavors were so smooth, and blended well together. It didn’t take long for me to finish my meal, and I returned to my photography. Bobbie dropped back by our table to see how we were doing. We had finished our meal, and now she tempted us with her homemade cakes and pies. When we entered, we had seen them in the front display case, which is just smart placement. All of the options sounded so good, but the Very Berry Cheesecake won the day. 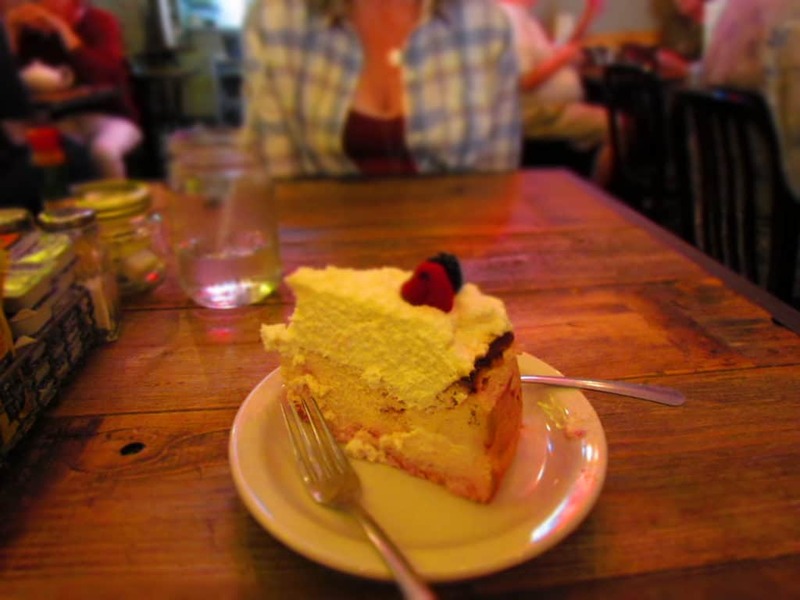 This double layer dessert is half cheesecake, and half whipped cream. It made a good blend of light and fluffy topping, and a firm foundation filled with a delicate berry flavor. It was so good, that even though we were full from lunch, we still had to finish the piece. We knew that we would be climbing the surrounding hills, so the extra calories were dismissed. Our visit to Mud Street Annex had been so enjoyable that we hated the idea of leaving. Of course, with so many other places to explore, we knew our exit was inevitable. Before we left, Bobbie tempted us with one more treat. The beautiful Fall day had just a hint of coolness, so she suggested a hot drink to take with us. 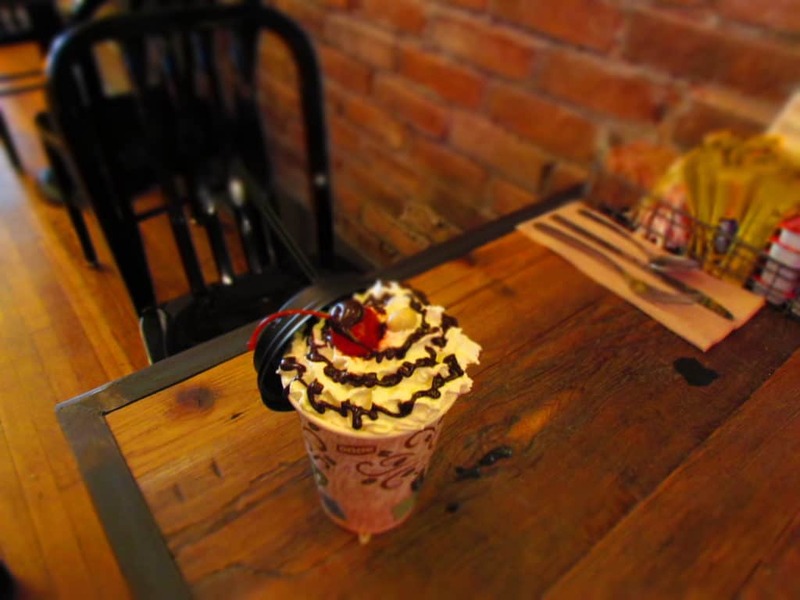 We were too full to consider until she mentioned the Chocolate Covered Cherry Coffee. In no time the sugary concoction was brought over, and we bid our farewells. Our time at Mud Street Annex had been a highlight of our day, and we felt like we had not just visited, but been welcomed into the family. We experienced lots of good restaurants in Eureka Springs, but this one set the bar at a new level. 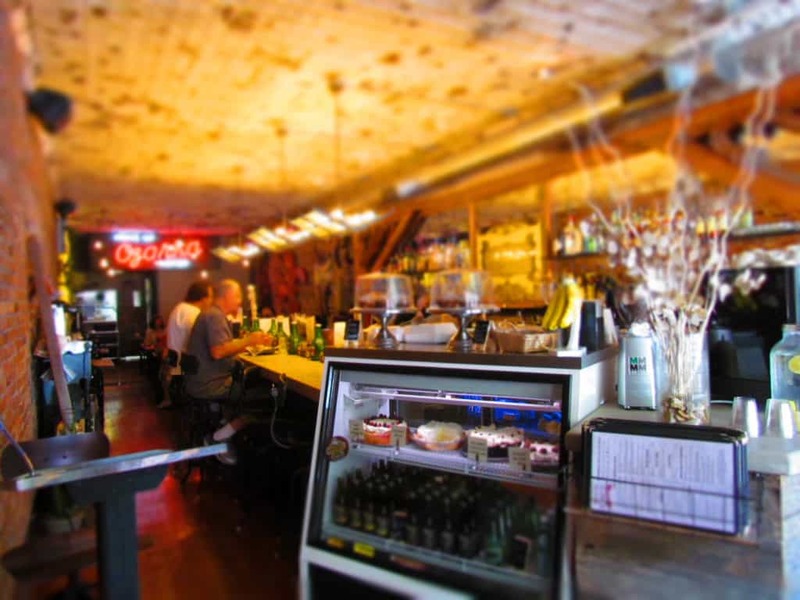 Many of you may have eaten at Mud Street Cafe in the past, but just wait until you see the Annex.